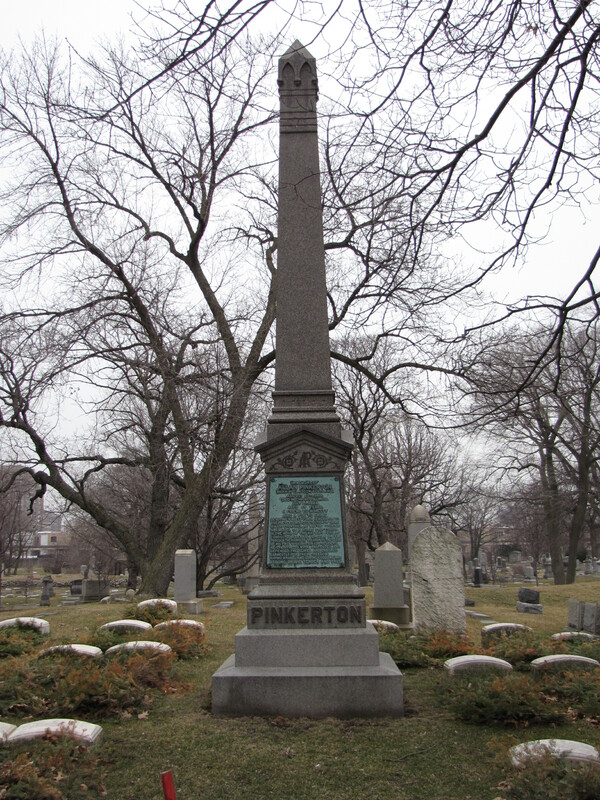 Not far from the Chalmers’ Monument in the Graceland Cemetery at Chicago, Illinois, is a plain obelisk with four bronze plaques, one on each side of the marker, that marks the grave of Allan Pinkerton, his wife Joan, and his two sons, Robert and William. Allan founded the first detective agency in the world and at the same time created a new profession. His detective agency’s motto “We Never Sleep” was emblazoned underneath an eye that stared straightforward. AND A FOE TO CRIME. DEVOTING HIMSELF FOR A GENERATION TO THE PREVENTION AND DETECTION OF CRIME IN MANY COUNTRIES, HE WAS THE FOUNDER IN AMERICA OF A NOBLE PROFESSION. IN THE NOUR OF THE NATION’S PERIL, HE CONDUCTED ABRAHAM LINCOLN SAFELY THROUGH THE RANKS OF TREASON TO THE SCENE OF HIS FIRST INAUGUARATION AS PRESIDENT. HE SYMPATHIZED WITH, PROTECTED AND DEFENDED THE SLAVES, AND LABORED EARNESTLY FOR THEIR FREEDOM. HATING WRONG, AND LOVING GOOD, HE WAS STRONG, BRAVE, TENDER AND TRUE.